Next week is LIMIT H.O.S.E. It should be loaded into Full Tilt by the weekend. This could be the first one I miss, as I am not feeling well today. But I am already signed up, so at least my chips will be there for the taking. This weeks tournament had a very intersting group, with 8 people coming out to play. All eight of the players had cashed at some point this year, and 6 of the 8 players were in the top 15 overall in earnings. I managed to hold my own for a while before getting knocked out in 5th place. NumbBono got 3rd, Ck got 2nd and Lighting36 got 1st (his 2nd win). Next tuesday will be Hi/Lo Pot Limit Omaha. Hope we get some of the Omaha players out (you know who I am talking to....yes, you!!) Hope to see you all out next Tuesday. 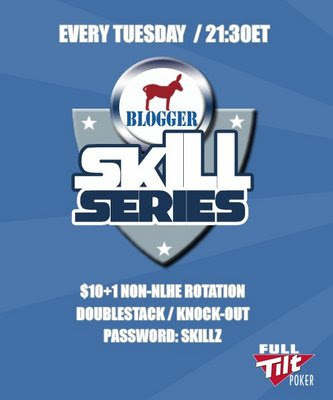 Skillz Game Tuesday is Limit 7 Card Stud, High only. Skillz Game Results Limit Hold'em - I FINALLY WON!! Yes it over a year of me hosting the tournament, but I finally won this one, in which is undoubtly my best game currently (even more so then No Limit). Got some good hands to get myself heads up with iaatg6296 with about an 8:6 chip deficit. Back and forth a lot at the beginning of heads up, and I caught a few hands including the nut flush on the river to eventually get a 6:1 chip lead. Still heads up lasted over 40 hands, and it was a great battle. iaatg finshed 2nd for the 2nd week in a row. Next week is 7 Stud Hi only. Hope to see you all there. It's like no limit, just slower. Be there, I know I will. Sorry. Busy week at work. I will update the leaderboard soon! Next week is Limit Hold'em. Be there!!! Horrible day at work, just wanted to sit down, jump on Full Tilt, and play some poker. Everytime I try to log in, I get that a download is needed, and when I click on ok......NOTHING. I hope no one else is having this problem, because it really isnt helping my day any. You all know the drill by now. Be there if you can, I will be! Nice turn out for last night tournament, with 9 players running. The first level we were at two tables (for late entries), but after the first 10 minutes we were at one table and a lot of good tight poker was player. I dont think we lost our first player until almost the one hour mark, which I was surprised for Pot Limit. Next week we play Limit HORSE. Hope to see you all there!